Interrupts are events detected by the MCU which cause normal program flow to be preempted. Interrupts pause the current program and transfer control to a specified user written firmware routine called the Interrupt Service Routine (ISR). The ISR processes the interrupt event, then resumes normal program flow. This article shows how to enable and process interrupts on the PIC16F1xxx family of Enhanced Mid-Range PIC® MCUs. The MCU must be programmed to enable interrupts to occur. Setting the Global Interrupt Enable (GIE) and, in many cases, the Peripheral Interrupt Enable (PEIE), enables the MCU to receive interrupts. GIE and PEIE are located in the Interrupt Control (INTCON) special function register. Each peripheral on the MCU has an individual enable bit. A peripheral's individual interrupt enable bit must be set in addition to GIE/PEIE before the peripheral can generate an interrupt. 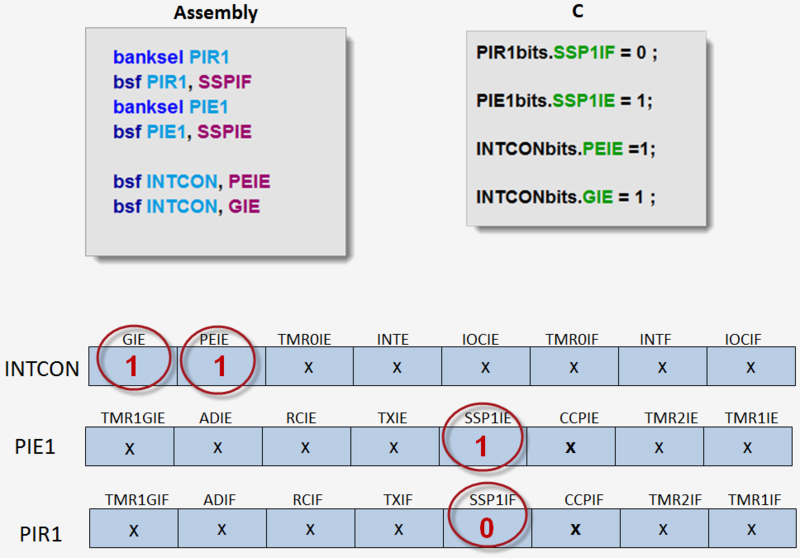 Individual interrupt enable bits are located in INTCON, PIE1, PIE2, and PIE3. When a peripheral reaches a state where program intervention is needed the peripheral sets an Interrupt Request Flag (xxIF). These Interrupt flags are set regardless of the status of the GIE, PEIE and individual interrupt enable bits. The interrupt flags are located in INTCON, PIR1, PIR2, and PIR3. The interrupt request flags are latched high when set and must be cleared by the user-written Interrupt Service Rountine. Global Interrupts are disabled by clearing GIE to 0. 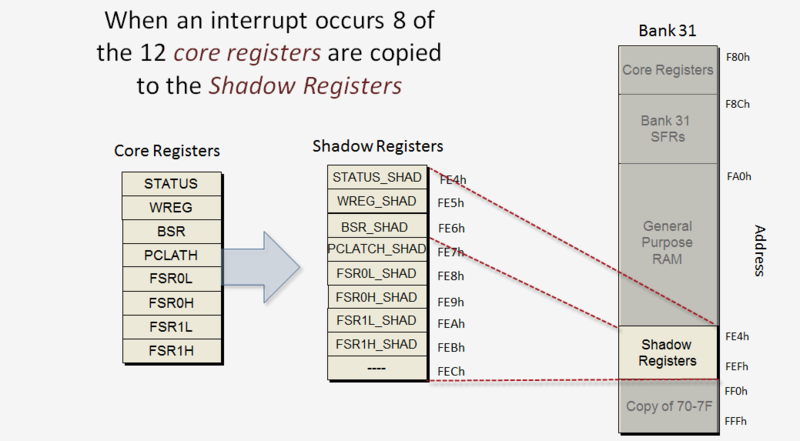 The current program context is saved to the shadow registers. The value of the Program Counter is stored on the return stack. Checks the interrupt-enabled peripherals for the source of the interrupt request. Performs the necessary peripheral tasks. Clears the appropriate interrupt request flag. Executes the Return From Interrupt instruction (RETFIE) as the final ISR instruction. The return address from the stack is loaded into the Program Counter. Execution resumes from point at which it was interrupted. INTCON contains global and peripheral interrupt enable flags as well as the individual interrupt request flags and interrupt enable flags for 3 the of PIC16F1xxxx interrupts. The INTEDG flag in OPTION_REG is used to set a rising or failing edge on the INT pin as the trigger for an INTE interrupt. 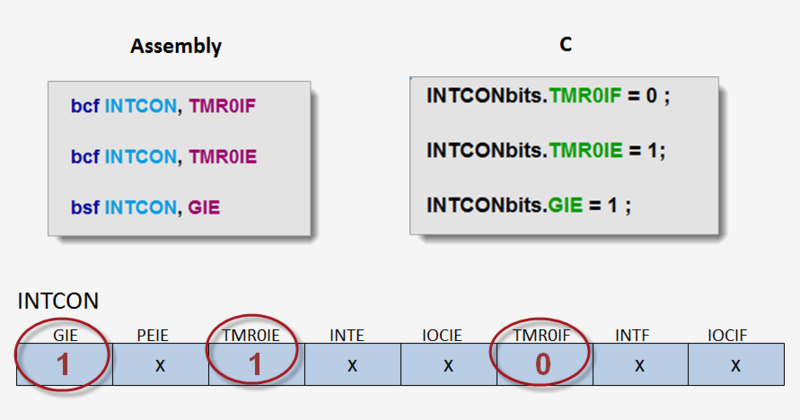 Three interrupt sources (Timer0, External Interrupt, and Interrupt on Change) have interrupt enable bits located in INTCON. These interrupts are referred to as 'core interrupts'. To enable one of the core interrupts only the individual Interrupt Enable bit and GIE need to be set. Clearing an Interrupt Request flag before setting the Interrupt Enable Flag prevents any pending interrupt requests from triggering an immediate interrupt. The PIC16F1xxx peripherals capable of generating interrupt requests each have their interrupt enable flags in one of the three PIE registers. To enable a peripheral interrupt the individual interrupt flag, GIE, and PEIE (peripheral interrupt enable) must all be set. The ISR is a user written program which performs the necessary tasks when an interrupt occurs. The user is responsible for writing the ISR and pLacing it at address 04h. The last instruction executed by the ISR must be the RETFIE instruction. ISRs can be written in either C or assembly language. The MCU's hardware will invoke the context saving mechanism when an interrupt occurs. There is one ISR which services all the interrupts for the application. 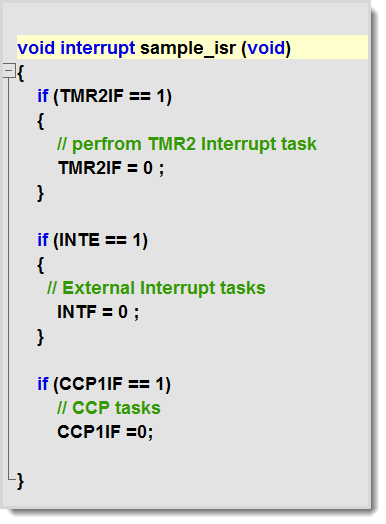 The ISR needs to sequentially check the individual interrupt request flags to determine the source of the interrupt. The Interrupt Request flags are latched when set by the peripheral. They must be cleared by ISR. Failure of the ISR to reset a request flag will cause another interrupt to occur immediately after the ISR returns control to the main program. The animation below shows code to setup and process an interrupt from Timer2 on the PIC16F1xxx enhanced mid-range MCU. The control icons at the bottom of the animation allow for the display to be paused and single stepped. Further explanation of PIC16F1xxx interrupts can be found in the Enhanced Mid-Range Tutorial. The 8-bit Timer Page provides the details on the setup and operation of Timer2.